Hmm, not sure what happened but my post of yesterday didn’t appear on the blog and I haven’t got a copy. Anyway, since arriving in Alghero on Thursday morning we spent the day getting the boat ready for her first sail of the season as well as shopping for the next few days. Whilst we were away on our trip last year we would regularly top up the heavy shopping items like cans and beers but we had deliberately run these down before leaving her in Alghero for the winter. One if the jobs was to replace the water pump as the previous replacement turned out to be far too butch for the system. It looks like it also managed to blow a fuse as we couldn’t get any power to the new one. 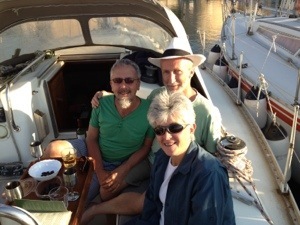 After an hour of trying to sort out, we gave up and went off to meet up with fellow S&CA club member, Nick Bamford, and his partner, Rich, for a drink on their boat Such Stuff before going out for a meal on the ramparts. Alghero is such a different place now with many tourists and all the restaurants buzzing. 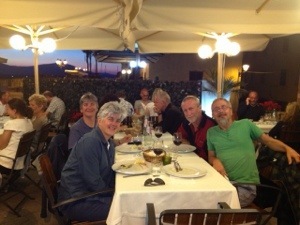 It was lovely to eat out on a balmy summer’s evening without even needing a jacket. Bliss! This entry was posted in Equipment, News and tagged 2013, Equipment, Italy, Maintenance, Med, Sardinia. Bookmark the permalink.